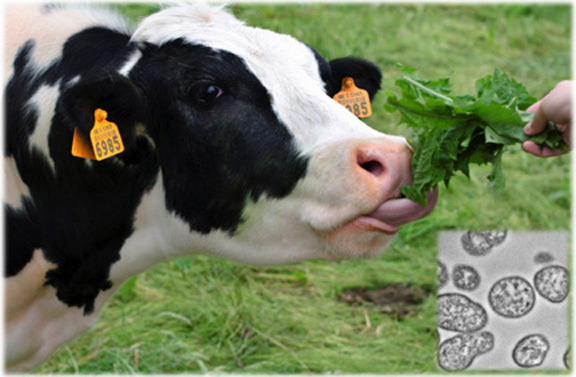 Fibrobacter succinogenes S85 (inset), an anaerobic bacterium found in the rumen of cows and other herbivores, may hold the key to breaking down the tough cellulose in plant matter, opening the way to clean-energy biofuels of the future. Enlarge image. Results: Cellulose, a tough biological polymer made of complex linked chains of glucose, gives structure to the cell walls of green plants. Scientists hope that someday this ubiquitous building block, the most abundant polysaccharide on Earth and rife with solar energy, will someday be a cheap and reliable feedstock for clean-energy biofuels. Scientists at Pacific Northwest National Laboratory and at the University of Wisconsin-Madison recently made advances in unlocking the mystery of how to break down tough cellulose in plant matter by investigating Fibrobacter succinogenes S85, an anaerobic bacterium found in the rumen of cows and other herbivores. Most anaerobic microorganisms degrade cellulose with cellulosomes, the multi-enzyme protein complexes that are nature's microbial digestion machines. But the new study by research team leader Stephen Callister, manuscript author Meagan C. Burnet, and colleagues suggests that F. succinogenes S85 employs an alternate mechanism. The researchers were trying to find out where most of the bacterium's cellulose-degrading enzymes were located. Were they in the environment external to the cell? In its outer membrane, or in its periplasm? Cellulose degradation, they concluded, was occurring outside the cell rather than inside. "We think the larger cellulose structure is being degraded in the environment outside the cell," said Burnet. That's where researchers found the majority of CAZymes, or carbohydrate active enzymes, including cellulose-degrading enzymes. They also found enzymes involved in breaking down the smaller subunits of cellulose, cellodextrins, in the bacterium's periplasm. "Interestingly, our data provide evidence that cellulose degradation by F. succinogenes involves the use of both fibro-slime and pilin proteins," Burnet added, naming some proteins that are not commonly associated with this process in other bacteria. Fibro-slime proteins are in relatively high abundance during cellulose degradation and are part of Fibrobacter's proteome. They likely take part in the cell's adhesion to cellulose. Why It Matters: Of all biological polymers on Earth, cellulose is the most abundant. Finding the key to breaking down its tough structure would accelerate the journey to a clean-energy future based on converting plant materials into fuel. Breaking down complex molecules to simpler ones is necessary to transform a substance's potential energy into fuels that are high-octane, liquid, and portable. But cellulose is a long-chain organic polymer; breaking its complex molecules down is difficult. With this additional research, the cellulose-degrading protein mechanisms within F. succinogenes S85 are closer to being solved, and they remain central to understanding how the bacterium works. These mechanisms could eventually lead to better optimization of enzymatic cellulose conversion to biofuels. The current study added to previous research by hypothesizing different mechanisms of cellulose degradation in this bacterium. It found that the majority of cellulose degradation takes place in a small space between the cellulose and the bacterium's outer membrane; the fibro-slime proteins appear to be important in generating this space for cellulose deconstruction. F. succinogenes S85 cellulose degradation mechanisms are now at least clearer for future researchers, said Burnet. "This paper takes us a step forward in our understanding." Methods: To see what they could add to previous studies on the cellulose degradation mechanisms of F. succinogenes S85, researchers did three experiments. In one, Garret Suen at University of Wisconsin-Madison and his graduate student Anthony Neumann did RNA sequencing on F. succinogenes S85 grown on cellulose and glucose. They found that most fibro-slime and pilin proteins had more expression in cellulose than in glucose. This may indicate they are involved in binding the cellulose. At PNNL's Environmental Molecular Sciences Laboratory (EMSL), Burnet used a subcellular fractionation of the bacterium grown on cellulose to isolate its outer membrane, periplasm, and extracellular media proteins. Subsequent mass spectrometry analysis showed an overlap in isolated proteins and a larger number of unique enzymes in the extracellular media. What's Next? Burnet said it would be interesting to do gene-knockout studies of the proteins found in F. succinogenes S85 to assess any impacts on cellulose degradation. Does the degradation decrease or stay the same? If the former, she said, "We know whatever we knocked out probably has a role in degrading cellulose." Sponsors: A portion of this research was funded by the Department of Energy's (DOE) Office of Biological and Environmental Research (BER) Pan-omics program and performed in EMSL, a DOE Office of Science User Facility sponsored by BER and located at PNNL. This research was also supported by a DOE Early Career Research Program to Garret Suen and by the National Institute of Allergy and Infectious Diseases of the National Institutes of Health. Research Team: Stephen J. Callister, Meagan C. Burnet, Mary S. Lipton, Richard D. Smith, and Alice Dohnalkova, PNNL; Anthony P. Neumann and Garret Suen, University of Wisconsin-Madison, Madison. In one sentence: A bacterium found in the rumen of cows and other herbivores may hold the key to breaking down the tough cellulose in plant matter, opening the way to clean-energy biofuels of the future. In less than 45 characters: From a cow's gut, a key to future biofuels.